Upping the adventure stakes on a beach holiday, a voyage onboard a crewed gulet is a magical way to experience the Mediterranean, dropping anchor in secluded bays, swimming, snorkelling or relaxing on deck. With Peter Sommer Travels you also get an insight into local culture, cuisine and archaeology thanks to their expert guides and tailor-made itineraries. For families who love life on the water, a cruising holiday on a traditional gulet is hard to beat. Our unique gulet cruises offer so much more for those who have even a passing interest in history and culture. Whether you choose the Greek Islands, Italy’s Amalfi coast or the Turquoise Coast of Turkey, our friendly and expert guides will be on hand to bring the amazing archaeological sites to life. Our latest release is a family adventure cruise in the Aegean. Your family can charter one of our beautiful boats and embark on a cultural voyage with expert guides. It’s ideal for smaller families, large extended families or groups of friends from four to 20 people. Gulets come in a range of standards and sizes. We only use high standard boats that we know personally. Each is chosen as much for its character, beauty and charm as for its amenities. We also create expert-led tours on land. We tailor each itinerary to suit – the balance is entirely up to you. 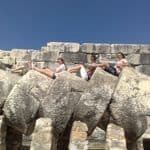 We understand that some children will want to be stimulated and soak up the fascinating culture and historical detail whereas others will be happier with a gentle stroll around some fascinating ruins followed by a long swim. If you prefer the idea of sharing a boat with other like-minded families, join our family gulet cruise. 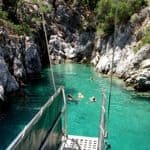 Cruising the Aegean: A Family Adventure explores ancient Greek and Roman temples, Crusader castles, Byzantine monasteries as well as a spectacular volcano. All this, while enjoying plenty of time for swimming, snorkelling and family fun on board and on shore. Rest assured, you will be in good hands. 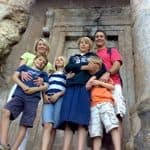 We’re a family-run company founded by me, Peter Sommer, in 1994, after I walked 2,000 miles across Turkey in the footsteps of Alexander the Great, falling in love with the country, its ancient civilisations and people. A British archaeologist and documentary maker, I’ve been organising and leading unique historical and cultural tours and gulet cruising holidays ever since. We’re particularly proud to have been awarded AITO’s 2015 Tour Operator of the Year Gold Award and 2016 Tour Operator of the Year Silver Award, based on exceptional independent customer reviews. Find out more about our unique gulet cruising holidays, private charters and family adventure holidays.